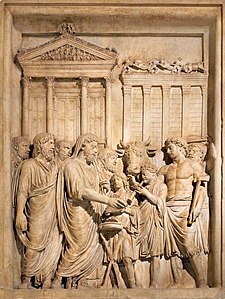 You mentioned in your post on Originalism class 4 that Roman priests would examine bird entrails in preparation for great political events. Actually, a Roman haruspex would examine the entrails (usually the liver) of any particular sacrificial animal, which could have been poultry if the offeror was poor, but was most commonly sheep. An augur’s method of divination, by contrast, involved watching the skies and interpreting the birds’ flight paths– most famously, when Romulus and Remus determined that Rome was to be founded on the Palatine hill rather than the Aventine when Romulus saw twelve auspicious birds in the sky, while Remus saw only six.